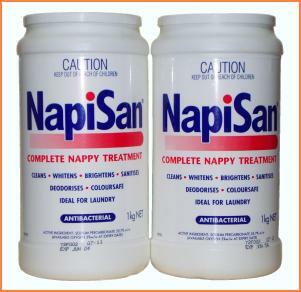 Napisan is a widely used Australian nappy treatment and a vigorous detergent. It's powerful germ-killing action ensures clean, white sanitised nappies every time; that's the "Napisan promise". Because it was developed for hygienically cleaning nappies, not only does it clean your clothes, it sanitises, deoderises, whitens and brightens them. Napisan's antibacterial, active oxygen formula keeps on working for a full 24 hours, killing bacteria involved in nappy rash, and removing stains in your clothes that would permanent otherwise. MIX - Completely dissolve 3/4 level lid (or 2 rounded dessertspoons) of Napisan in 7 litres (2 gallons) of warm water. This is sufficient for 6 nappies or several laundry items. Use proportionately more Napisan for larger quantities. Napisan can be used in a plastic bucket, laundry tub or your washing machine. Close container tightly after use. SOAK - Always make sure that the detergent is completely dissolved before dispersing items in the solution. Remove soil from dirty nappies and swirl nappies into the solution. Wet nappies can be placed straight into the solution. Soak for a minimum of 2 hours to kill germs. For persistent stains, soak overnight. Change solution every 24 hours to maintain sanitising power. RINSE - Remove items and rinse thoroughly. With Napisan there is no need to wash after soaking, simply rinse and spin dry in the washing machine. For nappies only, dispose of used solution by flushing it down the toilet. Rinse the bucket before re-use. DRY - Hang clean items out to dry, or if care instructions allow, use a tumble dryer. Do not dry acrylic garments in direct sunlight. Always follow garment manufacturer's instructions. Napisan is suitable for all washable colourfast fabrics. Always check colourfastness by soaking a hidden part of the garment. If unable to check, do not soak. Soak colours in cold water separately from whites. Do not use on silk, wool, or leather. Do not soak garment with metal buttons or zippers for more than 1 hour. Napisan does not contain chlorine bleach.